Markers are a go-to coloring choice for traditional artwork. They’re bright, whimsical, and each marker brand has different factors that stand out. The “best choice” all depends on what kind of artwork you do. Artists, architects, designers, and many other creatives all use markers for different reasons. So to help you find an awesome marker set I’ll explain the different features of art markers, what to look for, how to compare them, and ultimately help you figure out what is best for your particular needs. My top pick is the basic sketch set by Copic since this is general enough to please any artist of any skill level. But there are tons of choices out there so let’s dive in and see what we can find! 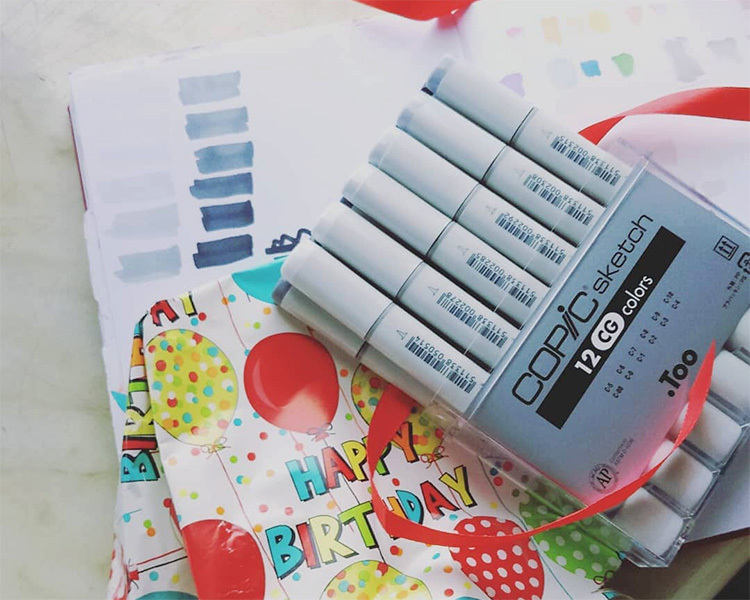 This Copic set gives you 12 of the most common shades for typical daily coloring. This set comes with a clear case to store the refillable markers. Nibs for each marker are long-lasting and replaceable for when they do start to fray and wear down. This set is great as a starter pack into Copic markers, or as an addition to an already established set. With a great pack of art markers you need to consider several things. And one of the most important things has nothing to do with the markers themselves. You have to consider the paper you use above all else. When drawing or coloring with markers the type of paper is important. Thicker, bonded paper will hold the ink, and layers of ink, better than thinner paper. Whatever paper you decide to use it is crucial to look for markers that won’t bleed through and paper stock that can hold up to multiple layers of ink. This is also true with most sketchbooks although many artists just use markers regardless of sketchbook paper. I mean, it’s a sketchbook. It’s meant to be messy! The quality of the ink is also very important. No two markers come with the same ink so each mixture has its own pros and cons. There are three major types of ink: water-based, alcohol-based, and solvent-based. Water-based markers are popular because they have no odor. They are fast drying, waterproof, and not soluble in most solvents. Alcohol-based markers allow you to mix colors more easily, although they can streak if you aren’t careful. The colors are waterproof but can be soluble in alcohol which is useful for thinning colors while blending. There is an odor because of the alcohol but it dissipates quickly. Solvent-based markers are made using one of three solvents: acetate is the most popular, but you may also find butryl or xylene as the solvent compound. These markers have bright, long-lasting colors, but they aren’t permanent. There is also a heavy lingering odor due to the solvents being used. Most artists would stick to alcohol markers although I’ve found many water-based markers that I really like. Unless you are creating a monotone piece, you will want to pick a marker set that has many different colors. And if you choose alcohol based markers you can thin and mix them to create new shades and more choices. But you’ll want colors that are vibrant and that won’t bleed. Because markers lay the ink down wet, you also want opaque colors that don’t lay the ink too heavy, especially if you are layering colors together. Markers aren’t subjected to lightfastness testing nor do they go through permanence standards. Just because a marker says it is permanent doesn’t mean the color holds forever. It could still fade over time. Each marker set should have literature to tell you what type of marker it is. Read the docs or skim their website online and determine if the markers work for your needs. The colors should also give you the opportunity to layer without bleeding. Most artsy paper types will help prevent bleeding, but too many layers can eventually bleed through the strongest paper. Also keep in mind that you can always buy multiple color packs together. But it’s worth sticking to just one brand if you do this. For example, Copic sells a ton of different color packs and they each vary based on a different style or subject matter. The tips will be important depending how you use markers. For most artistic markers there are three tips to choose from: Fine tips, broad, or chisel. Fine tips allow you to do detailed work in smaller areas. Broad tips are geared more towards coverage of larger areas and blending. Chisel tips attempt to be both, allowing you to work in small detail-oriented areas or give wide coverage with fewer strokes. You can also create different lines depending on how you hold and use the chisel tips. Some markers are dual-tipped which is really nice. This means they have a tip at each end of the marker tube. Depending on the brand you will usually find a fine tip at one end and a chisel tip at the other. These dual tipped markers are a great way to use multiple tips and colors without having to purchase duplicate marker sets. Just like colored pencils, markers have quality grades you need to be aware of. There are three basic grades: student(sometimes called scholarly), artist, and Copic. I’ll discuss Copic markers in the next section so let’s cover the other two. Student grade markers aren’t as expensive as the other options. However, they aren’t designed for professional applications. While the price may be alluring at first, if you are a professional then student grade markers should be avoided. They just won’t give you the final quality that you need for a finished piece. On the other hand, if you only want to color or draw as a hobby, student grade markers will be just fine. Artist grade is where you will spend most of your time looking. Unless you decide to go with the more expensive Copic markers, artist grade are the 2nd best choice and will do very well for your applications and projects. They are permanent, offer a wide variety of colors, and while they aren’t the cheapest to buy, they aren’t as expensive as Copics. So it really comes down to your budget and your confidence in working with markers. Copic Markers are a Japanese brand specifically designed for artists. They are more expensive than most and are reusable, refillable, and have replaceable tips. These are like the Rolls Royce of art markers. You can buy Copic kits which build up over time giving you a massive collection of art markers with a huge variety of colors. Copics have become one of the most widely used and sought after brands in the world because of their blending abilities, color selection, and tip replacements. Plus you can re-up each marker by refilling when they run dry. Refilling the pigment tubes is easy and you can even create your own colors using blank Copic tubes and tips designed for just such a purpose. Their ink quality is perhaps the absolute best and the colors are super vibrant. Other companies have emulated the Copic marker, and offer them at a less expensive price, but they’re not quite the same. So with that said let’s dive into our list of the best markers and see what’s out there! Fair warning: I do love Copics and I really do recommend them for artists. If you can’t afford them don’t worry, I have listed alternatives, but I highly recommend giving them a try if you can. 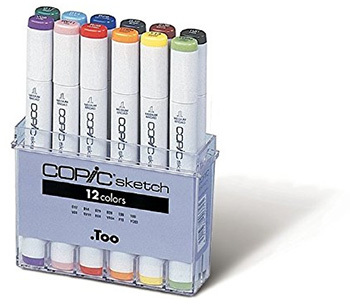 This Copic Marker 12-Piece Basic Set is designed to give a jump start to your collection. Over the entire Copic library there are several hundred Copic marker colors available. This basic set provides 12 colors that are used in almost every type of drawing. Simple and easy to start with. 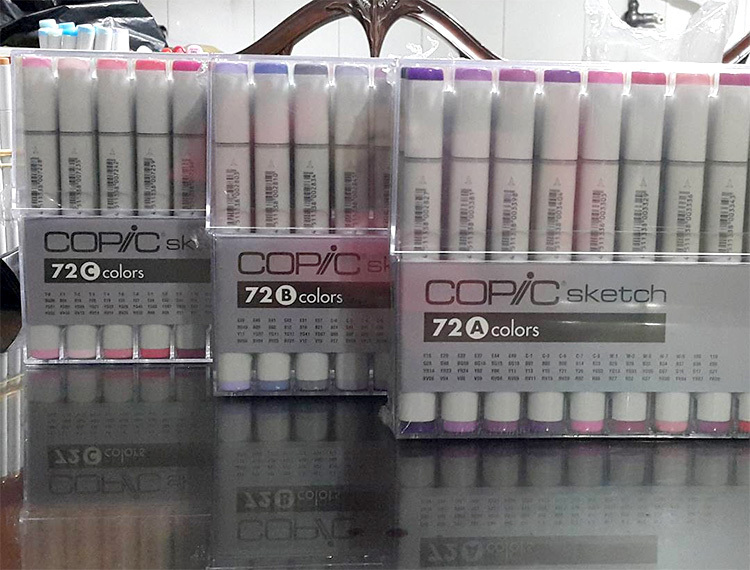 You can use this set to start your Copic collection or expand an existing one. Each marker is refillable with a solid and sturdy tube. The nibs are replaceable as well, as is Copic’s style. This gives you the ability to switch tips without changing colors. If you want to start with a larger set then the Copic Basic also comes in a 36 color kit which offers more neutral colors and a few more tone variants. If you are looking to spend a little more and really want a sweet marker set then go for the 36 pack. All Copic markers are alcohol based and permanent. The colors are vibrant, lay down smooth, and allow you to blend for your own colors. The fast-drying ink means you can lay down more color immediately and without any worry of streaking or smearing. Biggest downside here is that Copics cost a pretty penny considering everything you get. It would be nice to get larger packs, but at the same time you’ll rarely find a better brand than Copic. If you are drawing people, faces, or even animal skin, you will need skin tone colors. 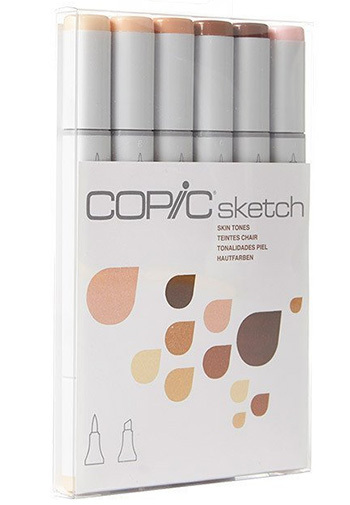 This Copic 6-piece skin set is perfect for all of that. You get six skin-toned colors to create all shades of skin, shadows, and highlights. Each maker is alcohol-based which means you can dilute the colors with alcohol, or blend while the colors are still wet. These colors won’t fade over time and dry acid-free. They play nice with other Copics too. You can also use the Copic airbrush system with these markers to give your work that soft, painted appeal. As with all Copic markers, the nibs are replaceable and the tubes are refillable. You can also mix colors to create your own variants of the tones if you prefer. The kit comes with a clear plastic container to keep everything in order. This is the first skin tone set made by Copic but there are others available with varying shades and tones. My biggest complaint again: the total number of markers compared to the tag. You’ll spend quite a bit to build up your Copic set, although in my eyes the end result is an incredible pack of markers that’ll last a lifetime. 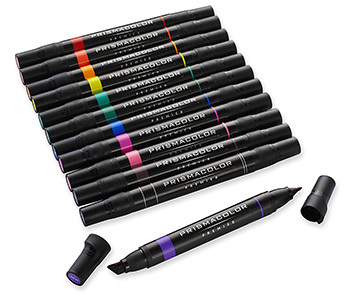 The Prismacolor Premier markers are some fantastic artist grade markers that come in 12 vibrant colors. The ink tube with each marker is a solid construction tube designed for even ink flow to both ends. This is because each marker has dual tips. On one end you will have a fine point nib. This can be used for all manner of coloring and the fine tip allows you to work in smaller spaces with ease. The other end offers a chisel tip so you can flip this around and start drawing big wide lines. Best of both worlds! Holding these markers feels great. Excellent width and weight to the body so you won’t need to push too hard to get marks on the page. These alcohol-based markers are near odorless and lay down smooth no matter which end you’re using. Unlike their Copic counterparts, these markers are not refillable and you can’t replace the nibs. But the Prismacolors are great for professional coloring, quick sketches, and on-the-go drawing for any paper type. Blending can be difficult and may contaminate the tips if the previous color isn’t dry. 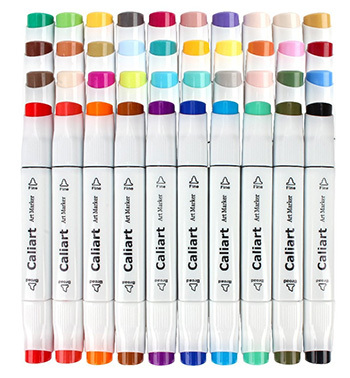 Caliart gives you an alcohol-based marker pen with dual tips and a great design. The set I recommend is this pack with 100 colors including skin tones, shades of all primary colors, grays, and pastels. Talk about a massive marker library! And along with the basic colors you’ll also get a colorless marker. This marker is used to smear, smudge, blend, and transfer colors without ruining the nibs on the other markers. There is a slight odor with these markers due to the alcohol base, yet it goes away quickly and the colors dry fast. The vibrant colors are permanent and don’t fade. Each tip provides color that can draw up to 1000 feet. However, the nibs don’t provide a constant flow of ink as some of the others. If you are drawing lengthy lines you may find that there are small skips or areas of the line that seem less opaque than the rest. The set comes with a zipper pouch to store the markers and the colors are noted on each cap, with a name and number for each marker to help identify the colors. The Artify Marker set is a pretty nice pack considering what you get. 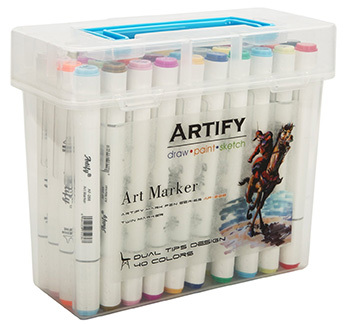 It comes with 40 markers, all dual tips, in a clear plastic carrying case. These markers are alcohol-based, permanent, and highly fade resistant. The set comes with a white marker as well that can be used to dilute colors or blend some together. On one end of each marker you get a fine tip for precision lines and detail work. On the other end you get a broad tip in chisel form. The colors dry fast and have a low, lingering odor that seems a lot better than similar markers in this space. Each marker is identified by a color name and number for easy replacement. The colors are on the caps for each end of the marker and the name and number are located on the marker tubes. I wish this text was a bit larger but it’s definitely readable. Now I did notice the caps are a bit tougher to get on. Not saying you’ll struggle or break a nail but you do really have to push. And if they’re not fully on then the cap can fall off, leading to some very dry markers. Just make sure the caps are tight when you’re done coloring and you’ll be fine. 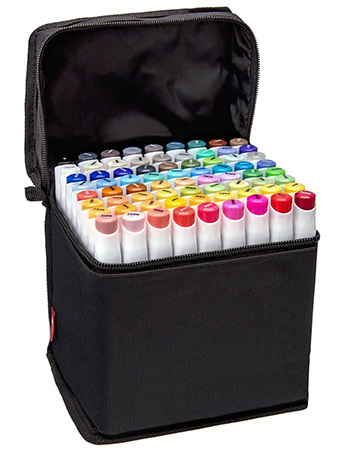 The carrying case is clear plastic and will hold all 40 markers snuggly to prevent damage to the inkwell. 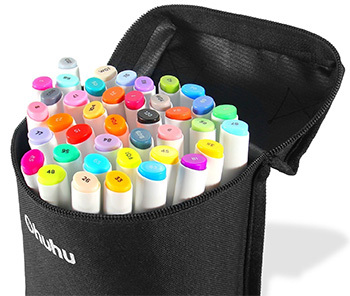 These Ohuhu Dual Tip markers are a water-based set that include 80 unique colors to choose from. Now these markers don’t dry as fast as some of the others listed above, and the colors are fairly translucent in the lighter shades. If you like to blend and overlay to make new colors this set will do you wonders. 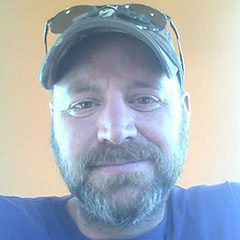 If not then you may find yourself laying multiple layers to get the color you want. The fine tip ends are bullet tips and while they are designed for precision work, they tend to be a little broad to get into tight areas. But they still work OK for laying single thin lines. It should also be noted that each tip is not the same size as another, and some bullet tips are noticeably larger. But the broad ends provide wide lines and lay down color smoothly. You can expect to use these markers for several months every day and never notice a lack of pigment. There is enough ink in each tube to draw almost 1000 feet of color. And these water-based markers have virtually no odor which is nice. Also the ink will bleed through most papers but that shouldn’t be a problem if you’re careful. Double check your paper type or lay down a board behind your papers so the ink doesn’t bleed into your desk. For something with a similar size you might check out the Classic Series from Bianyo. It comes with 72 markers(71 colors and a blender marker) with a nice variety in color. These alcohol-based markers are dual tipped with a range of 1mm to 7mm lines. All of the ink feels very thick and vibrant. And you can use these markers on any medium including cloth, clothing, ceramics, and obviously paper. The ink dries fast, is totally waterproof, and shouldn’t fade much over time. You may notice some fading if your work is left in the sun but if it’s stored in a cool dry place you’ll be fine for years. The colors are also bleed-resistant on most papers, though you should look for thicker stock. For example, newsprint is not a great idea if you want to avoid bleed through. Also this ink has a higher than average odor so it comes on strong. But it does fade quickly enough to not become a bother. I thought they were solvent-based at first as it is pretty strong. The color lay down is smooth and once it dries this leaves behind a very clear base of color. Blending can be done using the blending marker, though the colors are already so wet and deep that it can cause even more bleed through onto the back of your page. Now I’m a fan of Faber-Castell and have used some of their stuff for years. But with the Pitt Artist Set from Faber-Castell I had no idea what to expect. 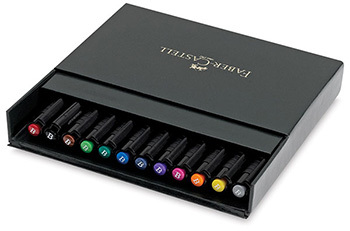 With this pack you get 12 unique colored markers all using a modern brush-style nib and an alcohol-based India ink pigment. The colors are bold and lay down very smooth. The markers themselves are pretty easy to hold but can get slippery if you often sweat at the palms. The single tipped markers use a brush-style nib that you can hold at various angles for different stroke types. The pens are the color of the ink so you don’t have to search hard for the color you want to use. I like this design much nicer because it’s just so easy to grab & start coloring. When you get the full set it comes in a box with a flip-top lid and slide-out cartridge for easy storage. The colors blend well and they do dry rapidly. If you plan to smudge or mix colors you need to be ready quickly. Otherwise you might find yourself re-applying the same colors into the same areas. The ink is dark but is resistant to streaking. India ink is one of the most permanent inks available and it’s also a heavy ink. If you are using thinner paper then multiple lines in the same area can cause the paper to slightly warp up as if it’s waterlogged. This is why I’d only recommend these markers for thicker paper and on finished pieces only. The art markers you choose to get will be an extension of your artwork and yourself. You want colors that’ll work just right along with blending that looks flawless and no streaky marks on your final piece. Your perfect art markers is somewhere on this list. For my money, the Copic Marker Basic Pack is absolutely the best place to start. Especially if you’re totally new to art markers and want to get into coloring fast. You not only get the Copic name and refillable ink, but you get a long lasting-set that can be expanded as time goes on. If you simply want a larger pack then check out all of Copic’s marker sets to see what you can find. There are dozens available and they each offer something a little different. Now if Copic isn’t your thing there are other brands to choose. But I’ve always been really pleased with Copics and that’s the only brand I recommend to serious artists.